The cost of hiring a professional plumber can be quite high even for the small plumbing tasks. In an attempt to save some money, many house owners will choose to carry out the small fixes on their own instead of hiring a plumbing professional. However, any small mistakes when carrying out a plumbing fix could lead to bigger problems which can only be fixed by an emergency plumber. An emergency situation that happens after house will cost you more in terms of added fees by the plumber. The most common and general plumbing mistake involves wrong selection of pipes when repairing leaks in your house. This is both in terms of the size and the type of the pipe that is used. The pipes may therefore fail to fit into each other, as you require. Using too much force when connecting two pipes together or forcing the connectors may break the pipes or the connectors. Further leaks may develop in the pipes and they may burst when pressure builds up in them. Corrosion may also occur if you get the pipe type wrong. Professional plumbers know when to use galvanized pipes and when to use copper pipes. Connecting the two will lead to corrosion which will require regular replacement of the pipes. Improvising makeshift tools and equipment in place of what the professional plumber uses is another regular mistake. For example, many people use marbles or ball bearings in place of a real level when installing or repairing bathroom fixtures. A ball bearing or marble may not exactly work when checking the level and this could force you into unnecessary reworks. Getting the level wrong when installing the toilet could also lead to slow flow of sewer or even backups in the pipes. Using the correct tools for a given task will not only save you time but will also ensure that the pipes do not crack as you are fitting them. You need to have a good design of where the sewer pipes are to be placed. This is especially the case when carrying out plumbing work in the upper floors of a building or apartment block. An odd DIY plumbing mistake involves routing the pipes in the wrong places so that they interfere with occupants of the lower floors of the building. Imagine a scenario where you are always woken up by the sound of toilet flushing from the floors above. A common practice by professional plumbers involves designing and planning the drainage network before implementation. The last DIY plumbing mistake in the list is failure to turn off the water stopcock before attempting any type of repairs. This is always the first thing that a professional plumber will do even for the smallest plumbing tasks at hand. Doing so prevents flooding, which often causes damage to household items. It will also take you added time to drain the water from the room. Trying to fix a small problem on your own and getting it wrong could create a major problem. Hiring an emergency plumber to rectify the bigger problem will cost you more. 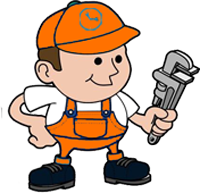 You should therefore take your time when doing your own plumbing work to avoid such mistakes or call a professional plumber in case you are not sure hot to mend the problem.